Trump Cultists Continue "Lock Her Up" Chants [VIDEO] - Joe.My.God. 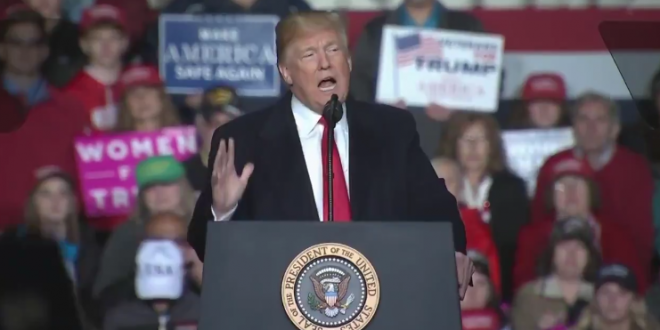 Attendants at a Trump rally in Wisconsin on Wednesday had apparently not paid attention to the President’s plea for unity earlier in the day, as they erupted in a “lock her up” chant mere hours after a bomb was mailed to Hillary Clinton’s home. Minutes later, President Trump took the stage and — without a hint of irony — called on “those engaged in the political arena” to “stop treating political opponents as being morally defective.” “Have to do that,” said a teleprompter-reading Trump, who has made personal insults against political opponents a cornerstone of his presidency.